The eminent church historian, Philip Schaff, described him as ‘the great church teacher of all times’. Augustine is a towering figure in the long history of the Christian church. Aside from standing as an important link between early Christianity and the Middle Ages, his views and ideas have deeply influenced how the Christian world understands God and his relation to us. Augustine, the man with upturned eye, with pen in the left hand, and a burning heart in the right (as he is usually represented), is a philosophical and theological genius of the first order, towering like a pyramid above his age, and looking down commandingly upon succeeding centuries. He had a mind uncommonly fertile and deep, bold and soaring; and with it, what is better, a heart full of Christian love and humility. He stands of right by the side of the greatest philosophers of antiquity and of modern times. We meet him alike on the broad highways and the narrow footpaths, on the giddy Alpine heights and in the awful depths of speculation, wherever philosophical thinkers before him or after him have trod. As a theologian he is facile princeps, at least surpassed by no church father, scholastic, or reformer. With royal munificence he scattered ideas in passing, which have set in mighty motion other lands and later times. He combined the creative power of Tertullian with the churchly spirit of Cyprian, the speculative intellect of the Greek church with the practical tact of the Latin. He was a Christian philosopher and a philosophical theologian to the full. It was his need and his delight to wrestle again and again with the hardest problems of thought, and to comprehend to the utmost the divinely revealed matter of the faith. 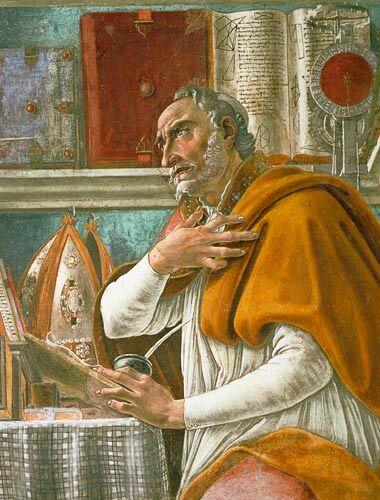 Augustine spent his youth pursuing sensual pleasures. He had a lady whom he lived with for several years. She had a child for him, though they never married. For several years he was an adherent of the Manichaens, a religious sect which held gnostic views and flourished in the Roman Empire. But he gradually fell away from them. Having pursued the study of Philosophy, literature and rhetoric both locally and in the city of Carthage, he eventually became a teacher of rhetoric. He moved to the city of Milan where he came under the preaching of Ambrose, the local Bishop. I was saying these things and weeping in the most bitter contrition of my heart, when suddenly I heard the voice of a boy or a girl I know not which–coming from the neighbouring house, chanting over and over again, “Pick it up, read it; pick it up, read it.” Immediately I ceased weeping and began most earnestly to think whether it was usual for children in some kind of game to sing such a song, but I could not remember ever having heard the like. So, damming the torrent of my tears, I got to my feet, for I could not but think that this was a divine command to open the Bible and read the first passage I should light upon. For I had heard how Anthony, accidentally coming into church while the gospel was being read, received the admonition as if what was read had been addressed to him: “Go and sell what you have and give it to the poor, and you shall have treasure in heaven; and come and follow me.” By such an oracle he was forthwith converted to thee. After his conversion, he moved to the city of Hippo Regius, the second most important city in North Africa at the time, where he was ordained a priest in 391 . He eventually became the Bishop and would go on to exercise a globally renowned ministry over the next thirty-eight years. He died in the year 430 as the city of Hippo was being overrun by barbarian invaders. Augustine laboured to clarify the teachings of the Christian faith and defend them against various opponents both within and outside the Christian community. He wrote numerous books and treatises with the aim of clarifying scriptural teachings, (including the Trinity, nature and grace, original sin) and refuting false ideas. He also wrote expository commentaries on the Gospels and on some Epistles. He opposed popular systems and ideas like Manichaeism, which threatened to destroy the Christian worldview with its dualism; Donatism, which threatened to disintegrate the unity of the Christian Church; and Pelagianism which threatened to corrupt the purity of the gospel. We will examine the last movement more closely. Pelagius was a British monk who denied that the fall of Adam had any effect upon humanity beyond the fact that we often imitate his negative example. We do not receive any corrupt nature from him, contrary to what had been widely understood within the Christian community. As elaborated by Louis Berkhof, Pelagius held that ‘There is no hereditary transmission of a sinful nature or of guilt, and consequently no such thing as original sin. Man is still born in the same condition in which Adam was before the fall.’ (History of Christian Doctrines, p.132) Therefore, God’s grace does not actually transform human nature; it merely assists us in doing what we could do on our own. Pelagius was impressed by the goodness of the created order, but failed to take into account the depth or consequences of the fall. He understood man to be capable of perfectly obeying God’s commands. Grace merely enables us to do more easily what we could still do without it. Augustine countered the views of Pelagius and his followers by clarifying and defending the Bible’s teaching on Original sin and God’s saving grace. All humanity have been affected by the fall of Adam. We are born with a sinful nature and our wills answer to this corrupt and sinful nature. The grace of God is needed not only for our past sins, but we continue to depend on it all through our lives as Christians. The Christian worldview is a realistic account of the human condition. It affirms that history is divided into 3 phases of Creation, Fall and Redemption. Each phase is essential to the integrity of the entire worldview. To minimise or under-emphasize one aspect is to jeopardize the whole story. The system of Pelagius was an unfortunate attempt in this direction. He so exalted the goodness and beauty of the created order but minimized the dark and gloomy reality of the fall. His carelessness with the second link thus radically distorted his understanding of redemption. By not staying close enough to scripture and by not carefully observing the universal human condition, he produced a distorted system which is intellectually appealing but spiritually debasing. His system seeks to elevate man but fails in the attempt. For it denies what every man in his deepest self knows to be true. And it wrenches from God the glory due to him alone.